Twyla Mae Whitefeather, “AABITOOSE”, which means The Middle One, of the Fish Clan, age 56, of Duluth, MN began her spiritual journey on Sunday, March 24, 2019 at the St. Mary’s Hospital in Duluth. 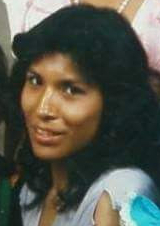 She was born on June 13, 1962 in Red Lake, MN the daughter of Cornelius, Sr. and Linda (Nopah) Whitefeather. Twyla loved being with her family and spending time with them. She was a very giving person who made sure you didn’t leave her home hungry. This showed with everyone. Twyla was a good caregiver and took in people in need. She loved to go on walks, doing bead work and other arts and crafts. She had a great sense of humor and she loved to joke with people and that will be missed by all who knew her. The family that Twyla joins again are her parents, Cornelius, Sr. and Linda; two brothers, Cordell and Cornell; and one niece, Cyrene Roybal. Those she leaves behind to cherish her memory are her sons, Edward and Frederick LoneEagle of Minneapolis; daughters, Lisa Whitefeather of Minneapolis and Rachel LoneEagle of Arizona; brothers, Cornelius Whitefeather, Jr. and Timothy Whitefeather both of Minneapolis; sisters, Carol Whitefeather, Corrinne Farkarlun, and Melissa Whitefeather all of Minneapolis; grandchildren, Domanick, Tawnee, Nasia, Kalaya, Maya, Savanah, Jeffrey, Anyssa, Nevaeh and Josilin. One great granddaughter, Araya, other relatives and friends. A wake for Twyla will be held Monday, April 1, 2019 starting at 7:00 p.m. and will continue until the 9:00 a.m. service on Tuesday all held at the Church of Gichitwaa Kateri, 3045 Park Avenue, in Minneapolis. Following the service, she will be moved to the Boys and Girls Club in Ponemah, MN where the final service will be held on Wednesday, April 3, at 10:00 a.m. Spiritual Advisor will be Jason. Pallbearers for the service will be Colin Roybal, Benjamin Roybal IV, Danny Farkarlun, Zenus Farkarlun, Domanic Whitefeather and Davontre Snoddy. Honorary pallbearers will be Cornelius Whitefeather, Jr., Timothy Whitefeather, Edward LoneEagle, and Frederick LoneEagle. Interment will be held in the Whitefeather Family burial ground in Ponemah.